Congratulations Matt Whatley for being awarded for your full art grant request of $30 ($20 for construction and $10 for SPLODEY)! First off, while Colin appreciates the new title Brigadier General, he wants everyone to know that the bMorg is no dictatorship. And he’s quite happy with the titles he already has: Chief Tiny Officer of Balsa Man, Director of the Black Pebble Arts Foundation, and Lead Manager for the Balsa Man KCrew. The BPAF didn’t really know what to make of this art project: The Cafe That Wanted To Be Art, by QueGee. We respect that it obviously has a lot of meaning for QueGee who says that “I built her for 8 years in homage to ‘Burning Time’ and now I want to give her a proper sendoff!” However, no one on the BPAF committee knew what this Burning Time was nor could they fathom why a cafe would require to be continuously under construction for 8 years. Nevertheless we did like the idea of a roving cafe and appreciated that this strange little project truly meant something to QueGee. Thus, the BPAF unanimously voted with a shrug* to award QueGee a tiny art grant! The Black Pebble Arts Foundation has awarded the Templini of Flux the full amount requested, $20, which is the largest grant we’ve handed out this year! The BPAF would like to support other star projects at this high amount but we won’t be able to without your support. 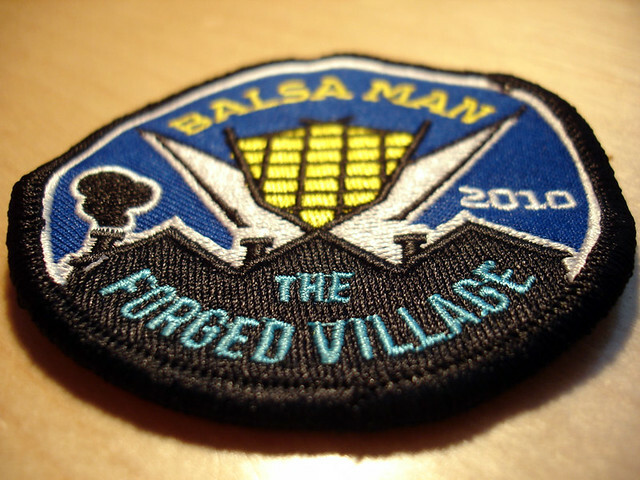 So please donate today to support more of the tiny art you love and get your own Balsa Man 2010 patch and sticker! We are all truly excited and can’t wait to see it standing proud on la playa. Construction has already begun on the Templini and you can see the detail and care going into it from this photo posted by J-Rad. Bats, red wine, Bela Legosi, and Austin, Texas. A strange combination for sure but certainly an interesting one: Toothpick’s Vampire Bar. The committee was divided on this one. First off, the BPAF has never before awarded an art grant for a bar before, and this was especially an issue here since the request was unapologetically for the “finest libations Trader Joe’s can offer.” Secondly, we don’t know how old this Douglas Worley is, for all we knew he’s some twilight emo kid and we could get in trouble for encouraging underaged drinking. In the end, the BPAF decided award the grant on both it’s merit’s and it’s novelty being the first grant we’ve ever gotten from Austin, Texas. However, we are only awarding it only for purchase of toothpicks, which we did a search for and you can buy a pack of 2500 craft toothpicks for $1.82 on Walmart.com. Also, since we think you’re a nice kid, we’ll toss in another couple bucks so you can buy a juice box—bringing your total grant award to $3.82! Congratulations Douglas! I’m sure your Toothpick Vampire Bar will be the best vampire bar on la playa! Oh and try not to sparkle too much, it creates a lot of moop. The BPAF was just discussing the other day how Balsa Man needed to expand its art horizons and with the event growing it would behoove the event to curate some star attractions with more refined artistic sensibilities. Now normally we prefer postcards but this was an exception and it’s only fitting that the grant request for an opera be sent as a letter. It was a unanimous vote* to award Fred Rinne $5 and whatever glowsticks we can find towards the Balsa Man Opera! In keeping with the fleeting nature of Balsa Man, Fred will be casting actors and musicians for the opera at the Balsa Man event immediately prior to the performance. If you are a musician with an accordion or other suitable instrument or have a good singing voice, please bring yourself and your instrument. If you would like to contact him earlier, he will also likely be at the Oakland Tiny Art Build Party making props for the Opera. *as long as you count the committee member Razorwire who, after showing up late, told us all what he thought of Opera with a simple finger gesture—his arm was raised though so under our bylaws it counted.